The primary goals of an SSP are to treat an entire population of animals as a single unit and promote cooperation among holding institutions to ensure the long term survival of the species in captivity. A minority of SSP populations support wild populations through reintroduction programs, but the majority of SSP programs exist solely to create a sustainable captive population to advance the mission of zoos for many years to come. Holistic SSP programs extend beyond captive management to encompass scientific research, conservation, and education programs that support populations in zoos and in the wild. On 12 September 2007, Western gorillas - the only species seen in zoos - were re-classified from "Endangered" to "Critically Endangered" by The World Conservation Union (IUCN). Only a decade ago scientists estimated there were more than 100,000 Western gorillas in Africa, but threats from the bushmeat crisis (illegal, unsustainable hunting of wild animals) and Ebola virus have wiped out so many gorillas that current estimates are closer to 30,000. Many of the gorillas killed by humans or disease were in protected areas like national parks, but limited resources make it difficult for people to adequately protect gorillas and support the people who live near them. This tragic news underscores the importance of zoos in educating North Americans about the essential role of wildlife in maintaining the health of the planet, the plight of wild animals and nearby human populations, and what we here in North America can do to stop current trends toward extinction worldwide. Research: Science guides much of the management practices of the SSP. Find out more about what research projects are currently being conducted or supported by the SSP. 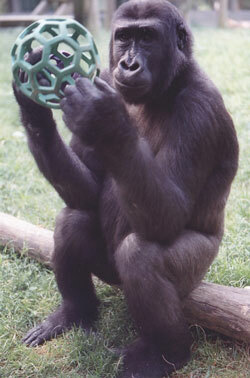 Education: Public outreach is vital to increasing awareness about the status of gorillas in zoos and in the wild. 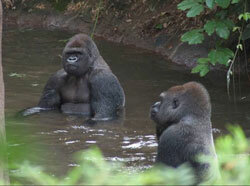 Find out more about gorillas and how you can get involved. Advocacy: Great apes face a myriad of challenges in today's world. The Gorilla SSP is committed to taking a stand on some of the critical issues facing apes as well as promoting optimal care in zoos. Conservation: Critically endangered in their native Africa, gorilla populations are perilously low due to several factors including deforestation, disease and the bushmeat crisis. The SSP supports in situ activities that address these issues. Husbandry: The people that look after gorillas in accredited zoos have some of the most rewarding yet challenging jobs around. 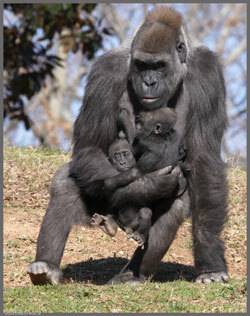 The SSP serves these institutions by providing contemporary information about the proper care and management of gorilla groups in a variety of settings. Although programmatically supported by AZA and our member zoos, any funding for our efforts is from independent granting programs or from the sales of our official Gorilla SSP merchandise. Please check out our products and support our program! Profits support conservation, research, and programmatic efforts of the SSP. AZA: The Association of Zoos and Aquariums, our governing body. Ape TAG: The Taxon Advisory Group for apes in AZA zoos. The Chimpanzee SSP: The Species Survival Plan for chimpanzees in AZA zoos. The Bonobo SSP: The Species Survival Plan for bonobos in AZA zoos. The Orangutan SSP: The Species Survival Plan for orangutans in AZA zoos. The Gibbon SSP: The Species Survival Plan for gibbons in AZA zoos. PASA: The Pan-African Sanctuary Alliance: caring for the staggering number of apes orphaned in Africa as a result of the pet trade, the bushmeat crisis and other factors. BCTF: Bushmeat Crisis Task Force: a consortium of conservation organizations and scientists dedicated to the conservation of wildlife populations threatened by commercial hunting. The Canadian Ape Alliance: an organization dedicated to raising awareness of the imminent threats to the great apes and developing conservation strategies. the world aquarium and zoo community. Funding demonstrates historic show of support for great ape veterinary care. 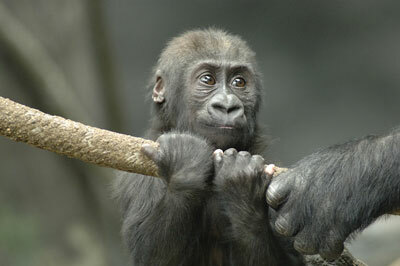 The Year of the Gorilla prompts a re-analysis of gorilla conservation strategies in Africa. Read more in the New Scientist...and Learn what YOU can do to help save gorillas. Gorilla baby joins family on exhibit at the San Diego Zoo.